Oklahoma: As indicated in the Texas reports below, both leaf rust and stripe rust are present across Texas with stripe rust appearing to be the most prevalent and severe. This also seems to be the case in Oklahoma – at least across central to southern Oklahoma. John Fenderson (Monsanto) indicated yesterday that on a recent trip he took across central to southern Oklahoma he saw “clean” wheat around Chickasha but along highway 70 going west to Frederick he saw lots of stripe rust and some leaf rust. In a few places he saw the ground colored orange from stripe rust spores indicating a stripe rust “hot spot.” In fields such as this (especially if there are many hot spots), application of a fungicide to control the stripe rust should be considered. In addition to helping to control the stripe rust, there could be the benefit of also limiting leaf rust, powdery mildew and possibly tan spot/septoria. Around Stillwater, I have not seen much change since two weeks ago. I have not confirmed any stripe rust, but have seen leaf rust. However, we have been mostly quite cold with only slight moisture but stripe rust may also be starting. I will wait until it warms up a bit before I look again. Dr. Amir Ibrahim (Prof, Small Grains Breeding and Genetics, Texas A&M AgriLife Research) 26-Feb-2015: The wheat crop in South Texas is at now at Feekes stages 5-6 [start of node elongation/first node detectable at base of tiller] depending on the line. Leaf Rust (P. triticina) is spreading in our trials at College station (Brazos County) and both ‘Baldwin’ catch plot and ‘TAM 110’ are 100S. As for stripe rust (P. striiformis), the ‘Sisson’ catch plot is 70S whereas the ‘Patton’ border is 100S. It is noteworthy that we reported stripe rust on Patton near Ennis (Ellis County) on January 29, 2015. Leaf rust is easy to find, but severity is very low at Bushland (Potter County) in Texas High Plains and Chillicothe (Hardeman County) in Texas Rolling Plains. Unconfirmed reports also indicated spread of stripe rust in Brady (McCulloch County) in the heart of the state. Reports also indicated that ‘Redhawk’ was especially susceptible there and that some producers are already applying fungicides. Both leaf and stripe rusts are also present in Wharton County in South Texas. If conditions continue to prevail, we can have significant leaf and stripe rust levels compared to last year, in my opinion. Dr. Ron French (Ast Prof & Extn Plant Pathologist, Texas A&M AgriLife Extension Service, Amarillo) 25-Feb-2015: Update on wheat rust in Texas- some commercial fields. Leaf rust had been reported in Texas in fall 2014 as far north as Hansford County (Texas Panhandle, bordering the Oklahoma Panhandle) and throughout NW Texas, especially the Texas Panhandle. 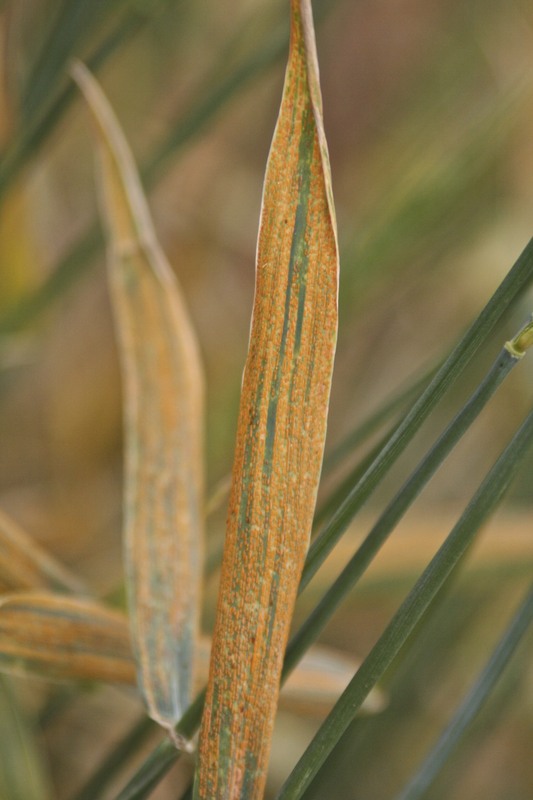 In early winter 2015, leaf rust was still found around the Amarillo area. This winter in Amarillo, we have had temperatures as low as 3°F and will still be as low as 12°F and not much higher than the mid- 50s F for the next week, including snow. In some cases when temperatures have dropped this much, some fields with trace levels of leaf rust no longer exhibited leaf rust for a while, whether that meant inoculum did not survive, was not active, or had new inoculum come in to that field. I visited some random fields today in the Amarillo area and was not able to find any leaf rust. This does not mean that leaf rust is not present but that it may be present at really low trace levels. Last Wednesday, February 18, I did find leaf rust in one wheat field in Wichita County at trace levels in very few plants and only in the lowest two leaves. The biggest wheat in that field was at Feekes 4. Wichita County is in the Texas Rolling Plains and borders Clay, Wilbarger, and Archer Counties in Texas, and Tillman and Cotton Counties in SW Oklahoma. With high temperatures expected not to be higher than 63°F and as low as 25°F for the next seven days, could disappear, as observed in previous years when leaf rust was first observed in mid-to-late March. Unlike 2014, no leaf rust has been observed so far in the lower Coastal Bend of Texas around Kingsville and Corpus Christi by this time. Some days have been cooler than normal and they have had more rain than in some previous years. Stripe rust has been present as far west as Tom Green County in west Central Texas, where the city of San Angelo is located. Stripe rust was first observed at the very end of January and beginning of February. Stripe rust levels were significant in lower leaves only and the ground was covered in orange spores. A few fields that were sprayed with Tilt on February 16th had taken advantage of the fact that topdressing of nitrogen was being done on the wheat. Within a week, fields looked great and new growth looks “excellent” (probably a combination of topdressing, moisture from overhead pivot irrigation, root growth, and the fungicide application). At time of spraying, the wheat was fully tillered. Some varieties with some level of stripe rust include TAM 113, Coronado, Greer, Redhawk, Cedar, and TAM 304. The farthest north I have seen stripe rust is in Wichita County at low trace levels, on February 18th. The biggest wheat in that field was at Feekes 4. Although normally dry, this area may be getting some snow and rain in the next week or so, so there could be an increase in inoculum. But since temperatures are expected to range from 25° to 41°F on the low side, and between 32-63°F on the high side for the next seven days, this may not be conducive to stripe rust increase or establishment. Time will tell. Other fields in that area have not had stripe rust so far from what I gathered today. Other locations with stripe rust include fields around De Leon, in Comanche County, located in Central Texas. The application Tilt in February is not uncommon in some locations in southern Texas as powdery mildew can be an issue. This year, applications of Tilt have occurred due to stripe rust concerns and in many cases, taking advantage of top dressing of nitrogen on wheat. 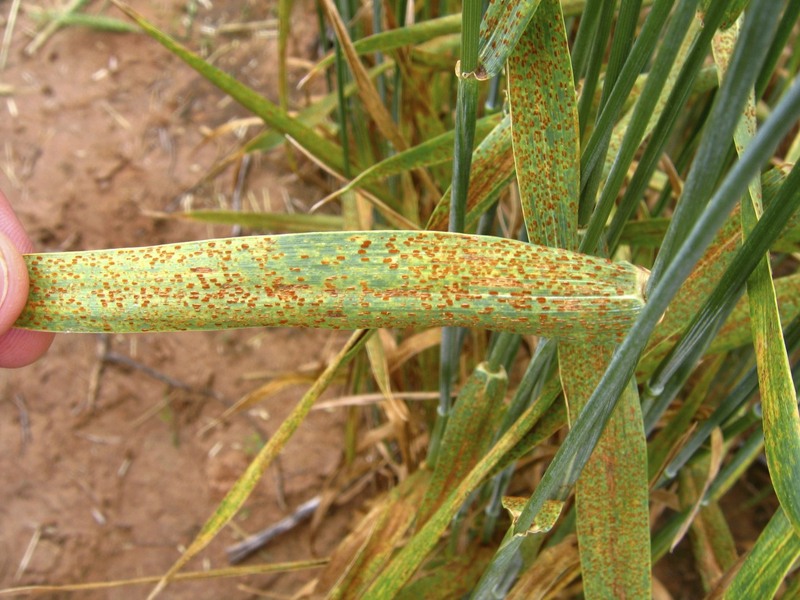 By osuwheat in Bob Hunger, disease on February 27, 2015 .